"These fragrant preserves are simple to make, and may be stored. Toast and biscuits will never taste the same again!" Crush 1 cup chopped peaches in the bottom of a large saucepan. Add remaining peaches, and set pan over medium-low heat. Bring to a low boil, and cook for about 20 minutes or until peaches become liquid (my family likes a few bits of peach left) . Pour peaches into a bowl, and then measure 6 cups back into the pan. Add sugar, and bring to a boil over medium heat. Gradually stir in dry pectin, and boil for 1 minute. Remove from heat after 1 minute, and transfer to sterilized jars. Process in hot water bath canner for 10 minutes. Let cool, and place on shelf. These fragrant, fruity preserves are amazing on toast, biscuits, and pork chops. When making preserves and jams, select slightly underipe, firm fruit . 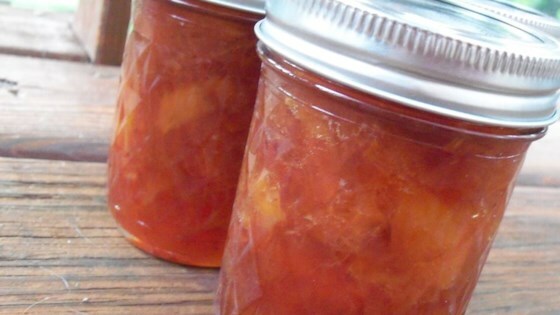 The best peach preserves recipe - I have ever used or eaten.